Our hot new Magnetic Beer Cap Maps are the perfect size for wall display – not too large, not too small. 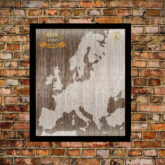 Now available in three popular sizes our Magnetic Beer Cap Maps are great looking high-resolution maps of the best brewing countries, states and regions around the world. 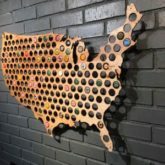 Each Magnetic Beer Cap Map has plenty of room for hundreds of your favorite caps along with wood-grain backgrounds for craft beer decorators of all ages. Fill each map with all of your favorite caps or just ones from breweries that reside in that area. Metal bottle caps simply stick right to the magnetic surface of the map so they can be easily displayed in your living room, home bar or restaurant with extreme ease of swap-out when you find a new or favorite brew! 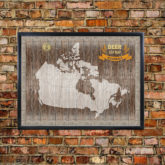 Magnetic Canada Beer Cap Map – Caps simply stick to the map. Each map is large enough for hundreds of your favorite beer caps. Our revolutionary new Magnetic Beer Cap Maps are the perfect size for wall display – not too large, not too small. 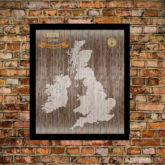 Now available in popular sizes our Magnetic Beer Cap Maps are great looking high-resolution maps of the best brewing countries, states and regions around the world. 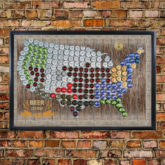 Each Magnetic Beer Cap Map has plenty of room for hundreds of your favorite caps along with wood-grain backgrounds for craft beer decorators of all ages. Fill each map with all of your favorite caps or just ones from breweries that reside in that area. 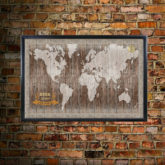 Metal bottle caps simply stick right to the magnetic surface of the map so they can be easily displayed in your living room, home bar or restaurant with extreme ease of swap-out when you find a new or favorite brew! 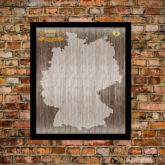 The Magnetic Germany Beer Cap Maps are great looking maps. Caps simply stick to the map. Each map is large enough for hundreds of your favorite beer caps. 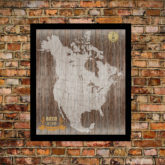 Our Magnetic North America Beer Cap Maps are great looking maps. Caps simply stick to the map. Each map is large enough for hundreds of your favorite beer caps. Size does matter! Unlike other cap maps on the internet, our X-Large 23″ x 37″ Beer Cap Map is the perfect size for wall display – not too large, not too small! Beer Cap Maps are great looking laser-cut maps of the best brewing states in the US. Each USA Beer Cap Map is filled with plenty of holes (177 holes) for your favorite caps along with a spot marking the state capitol location. Fill them with all of your best caps or just ones from breweries that reside in that state. Caps pop in the back and are held snugly in place so they can be easily displayed in your living room or home bar. 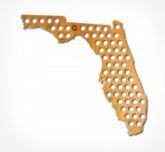 In addition to offering every US states, Swiftmaps.com also offers a Florida Beer Cap Map.